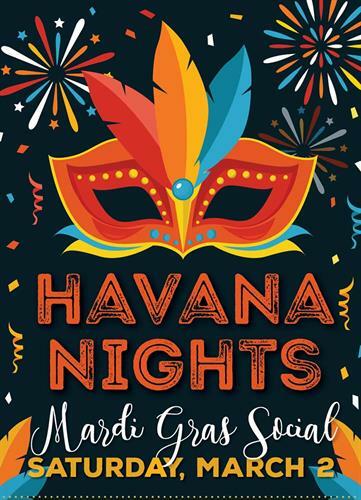 Havana Nights, a Mardi Gras Social features a Cajun-inspired dinner and a musical performance by the popular band John Roberts y Pan Blanco! Reserve tickets online in advance for this limited-seating event. For the dinner and show (Reservations are required by February 28): $50 per person; $90 per couple. For the show only: $25 per person if reserved in advance; $30 per person at the door. Dinner and show: $50 per person; $90 per couple (reservations are required by February 28). Show only: $25 per person in advance; $30 per person at the door.